What would this blog be without a roundup of my finds at my very favorite annual rummage sale? I’ve explained all the details in my 2013 recap, but, in case you missed it, here’s the important information: multiple horse barns full of everything you can imagine; an awesome old guy named Wiley who works the glassware section and prices everything at a quarter; ladies in the fabric section who can’t believe how much fabric I buy. Does it sound good enough yet? Every year, my mom and I plan our attack strategy in advance. In the beginning, circa 2007, I was all about refashioning clothes, so the “fill-a-bag” clothing was always a high priority. The years after that had varying craft priorities: furniture, screenprinting supplies, books. This year, we approached the sale as seasoned veterans. We knew what we wanted to see, and we knew what to skip. We managed to leave the sale without any clothing, and even skipped the book barn altogether. From there, the logistics were simple. We’d start in furniture (where the coolest things go fastest), run through housewares, then take our time looking through fabrics. We opted out of the $5 early-bird entry, instead arriving promptly at 8:45am to prepare for the 9am free-admission opening. As we watched the early birds load their vehicles with treasures, we were relieved – nothing super cool had been claimed yet. When the doors finally opened, we began perusing the aisles of furniture. My apartment finally has nearly all the furniture it needs, and of course my mama doesn’t need much more furniture at her house, but you never know if you’ll find something special. My mom bought a small stool, not quite as adorable as my 2010 hassock but definitely a good $5 find. Pricing was odd this year – many pieces of furniture were hugely overpriced for a secondhand, charity sale: some dressers were running between $100-200, and a few dining sets even exceeded that range. I tend to enter Extreme Bargain Mode on rummage sale day, and anything more than $10 feels like I’m forking over half a paycheck. So furniture wasn’t a big hit for us this year. 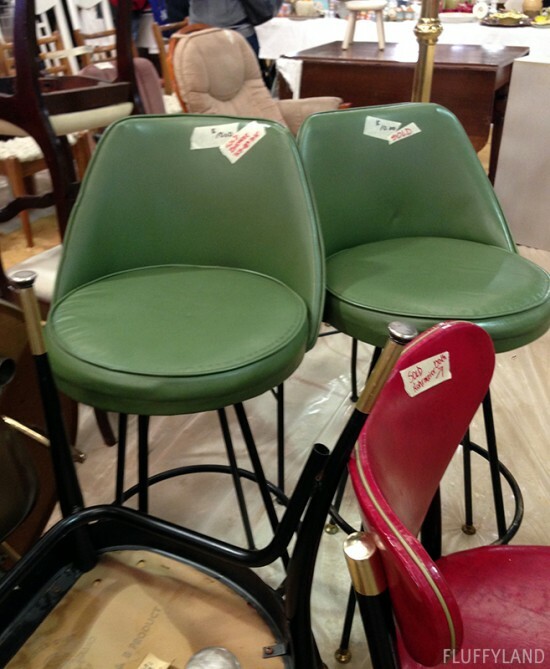 But when I saw these chairs, at $10 each, I got excited. Green vinyl bar stools with steel legs – and they have a funny little back? How quaint and comfy! And how within the rummage sale budget, at $10 apiece! But, alas, they were sold to an early bird. No stools for me. But wait! 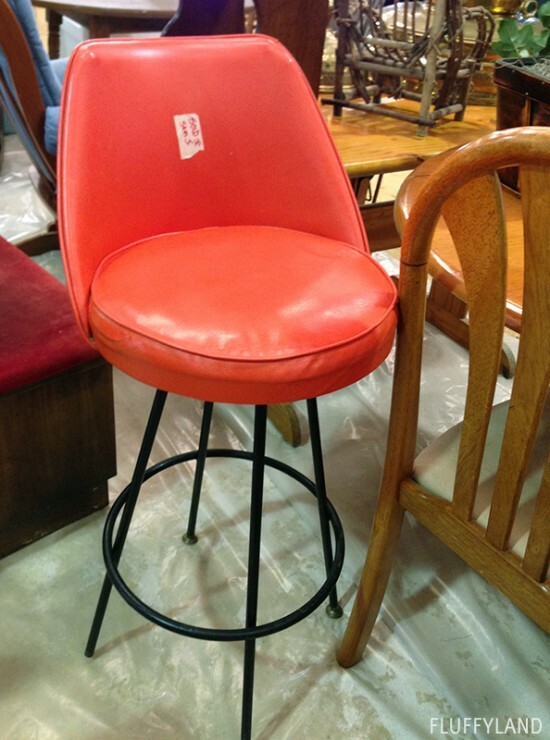 Half a turn away, a lone orange chair awaits. An even better color, even cuter in its single-ness, and not-yet sporting a “sold” sticker. Great news for Sam! My first purchase of the day. 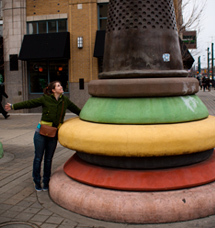 From there we headed to housewares, something I can never get enough of. 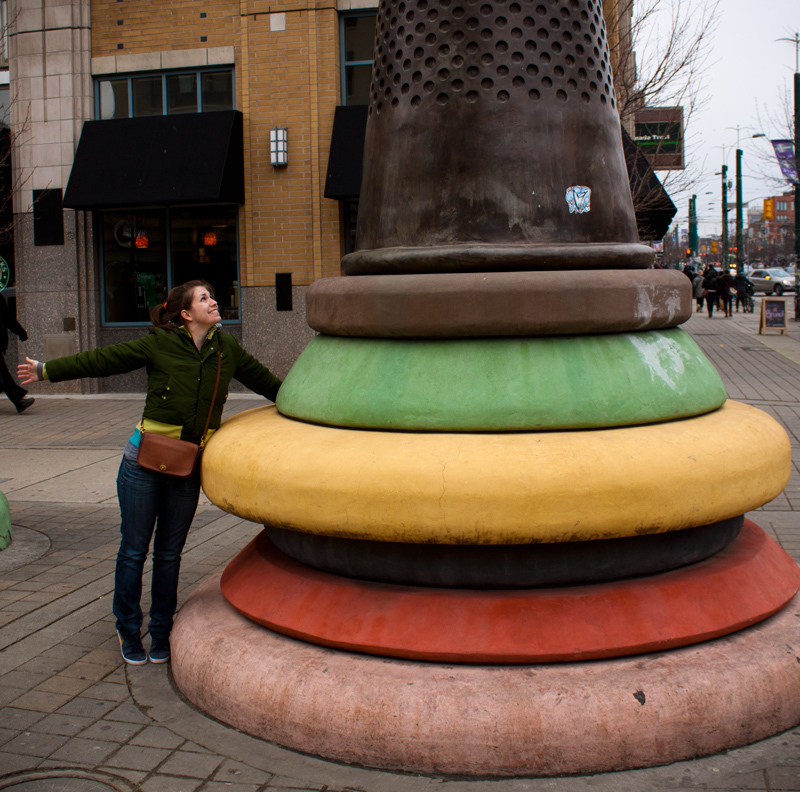 I corralled an armful of (matching!) 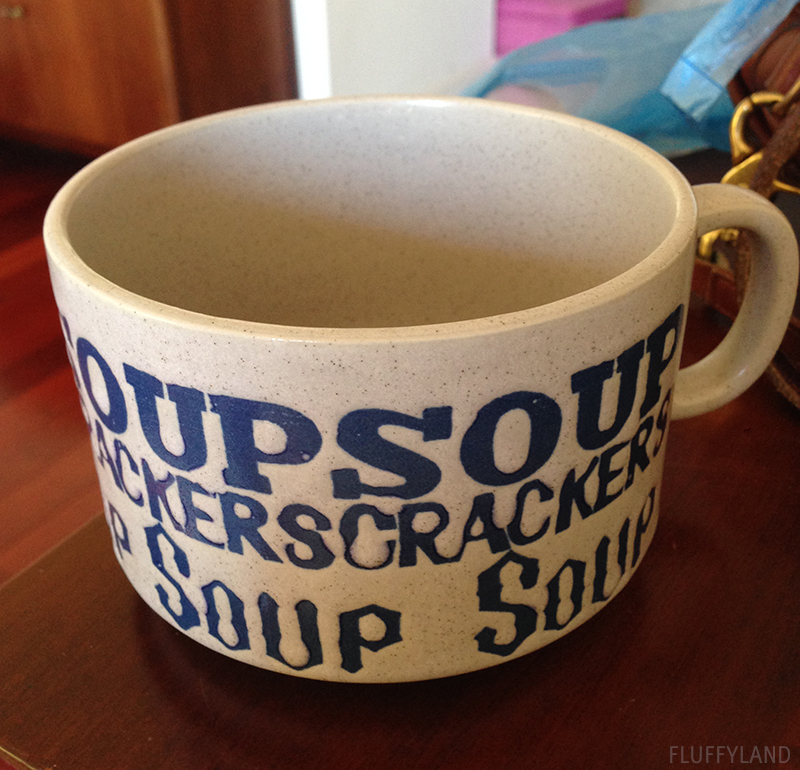 wine glasses, a big glass pitcher, a meat thermometer, a yellow bowl, and this incredible “soup crackers soup crackers soup” mug (which begs the question, what do I eat out of this?). I approached my buddy Wiley from last year, and went through my pile. I also ended up in that zone at the end of our visit – it’s always worth a second lap since there are many boxes under the tables that only get unearthed once some space has been cleared. I snagged a bunch of wire shelves and wire baskets for my kitchen cupboards (the kind that retail for ungodly prices ) and a few similarly useful items. Not as fun, entirely practical, but a big win for rummage sale day. I went a little crazy with the fabrics this year. The photo above shows all my big cuts; I also bought a bag full of small scraps. 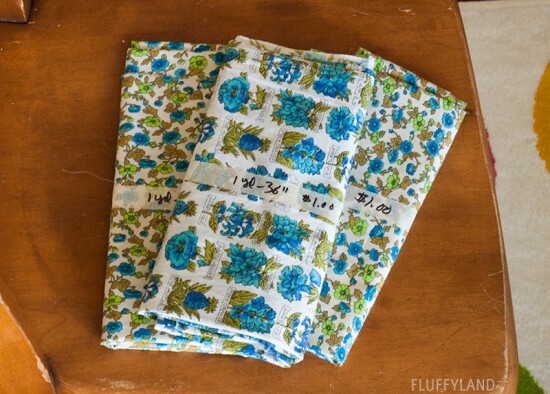 I’m trying hard to buy fabrics that will help me use what I have, so most of my scraps are white, natural, or navy cottons: perfect for linings or interlinings. In the piles above I also have a nice gray blend, a huge cut of navy cotton, and a white and yellow striped lining that I’m hoping to use in a skirt (or coat?!) someday. The white lacy piece is over 5 yards long, and it’s already earmarked for my bedroom curtains. 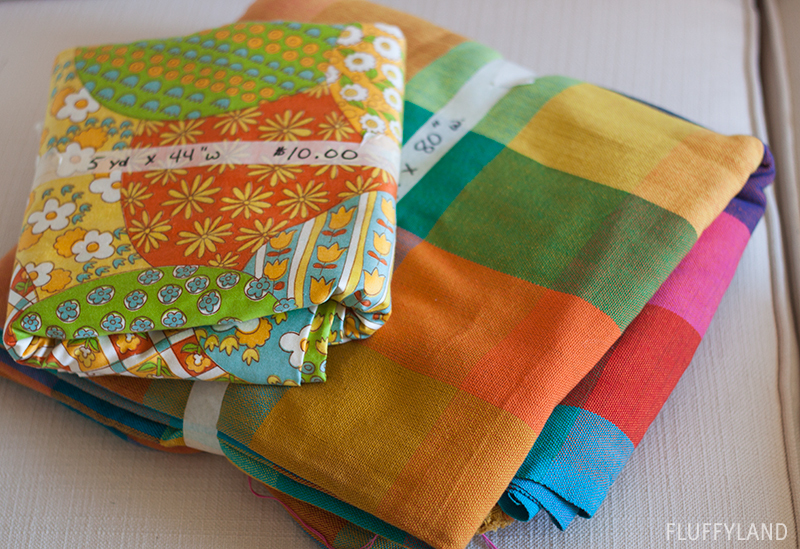 These colorful fabrics are the best. I want to use the vintagey one to make a cheater quilt, and the big bold checks would also make an amazing blanket. I’ve only been in my apartment for six months, so I still have homemaking on the mind. These fabrics are a matching set. No plans yet, but they’re darling and had to come home with me. 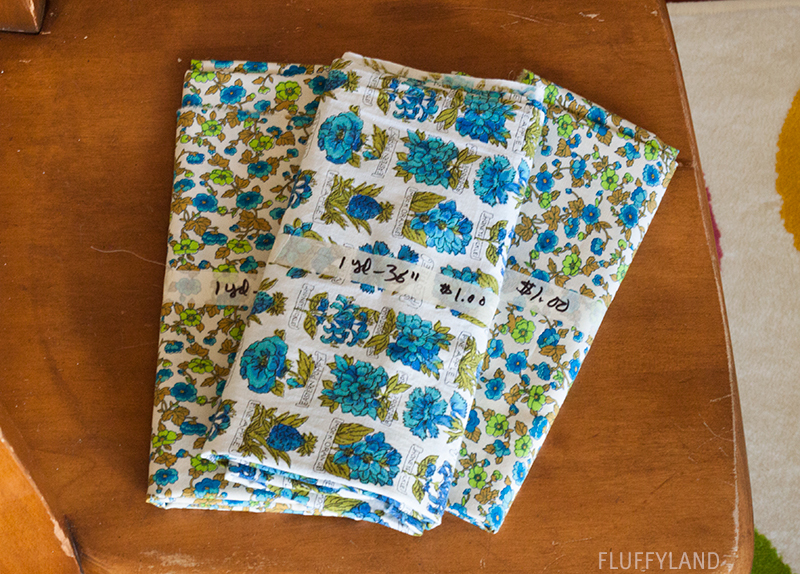 The woman working the fabric section asked me, “So, will you have used all these fabrics by the time we’re here again next year?” I laughed a quick, “No way,” but in my head I wanted to say, lady, let me buy some fabric guilt-free… I know I’ll never use it all but it’s just so pretty! 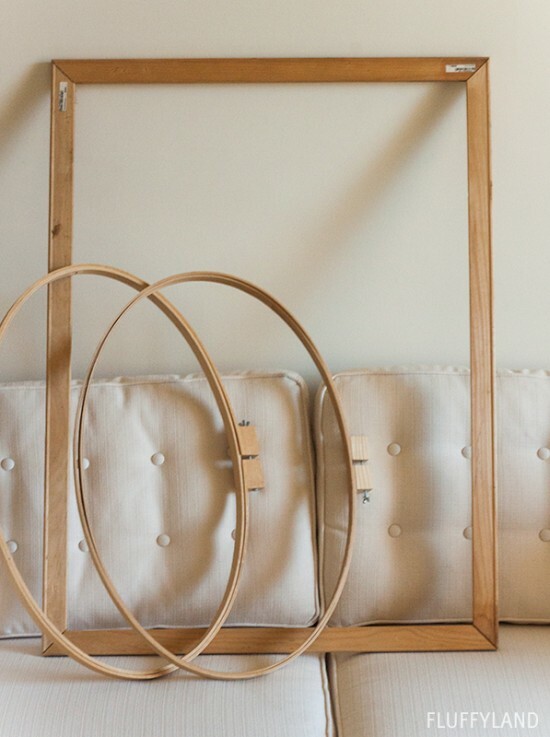 This giant frame was exactly what I sought for a recent craft project! That’s the best part about rummage sale day: it always sparks new projects, but sometimes it helps finish an old project that’s needed something special. And the giant quilt hoops are destined for wall art as well, of course. 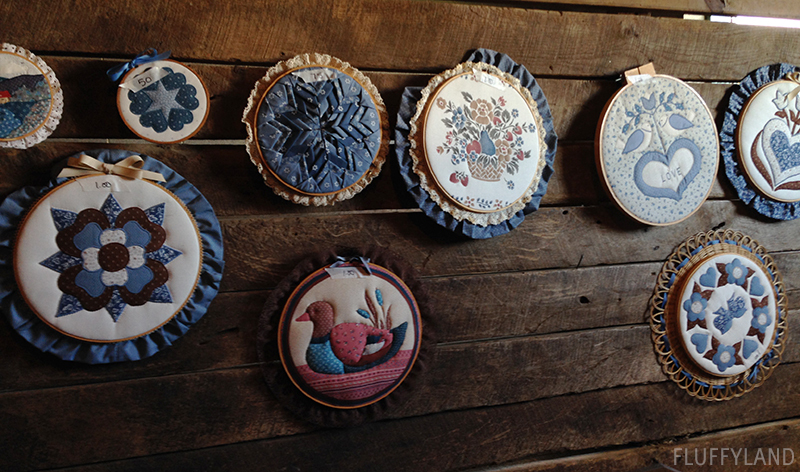 I decided not to pull inspiration from the embroidery hoop wall art that was for sale in the Crafts barn. I don’t think my apartment is in need of quilted ducks! But, of course, this is always the best part of the rummage sale: laughing with my mom about the crazy things we find… and laughing even harder (sneakily, of course) when we see someone buying such crazy things! I’m sure they laugh at me, too, lugging a garbage bag full of fabric around. “Clearly she won’t use it all,” they say. They’re right. 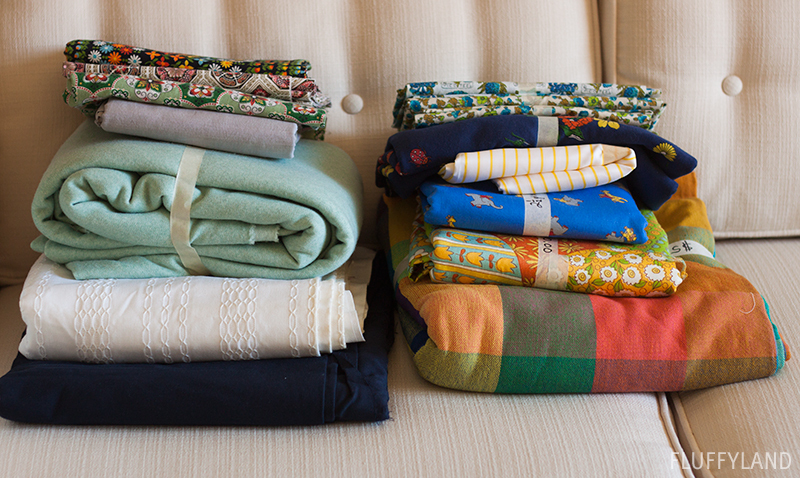 But I’ve got to stockpile for a winter of sewing, and it’s going to be wonderful. I already can’t wait for next year. Rummage sale day is truly my favorite day. It’s so wonderful to share rummage sale day with you:). So much fun and a glorious fall day! !